Beautiful Interior Design in Watermill, NY. This traditional watermill new build is in the heart of the Hamptons. In this 2017 new construction, Hampton Design worked closely from the beginning with architectural designs and the building process. Through a clean, white yet unexpected look, this home embraces the fun of family life and social entertaining. State-of-the-art appliances and beautiful, handcrafted materials maintain a comfortable, approachable feel. The home is mainly white and hardwood with touches of color in “adult” spaces. "Kid areas" are vibrant and whimsical playscapes. This kitchen is bright and classic: a Hamptons beach home with European bistro touches. The counters are white Calcutta marble that compliment the Hampton Design custom cabinetry and white subway tile backsplash. 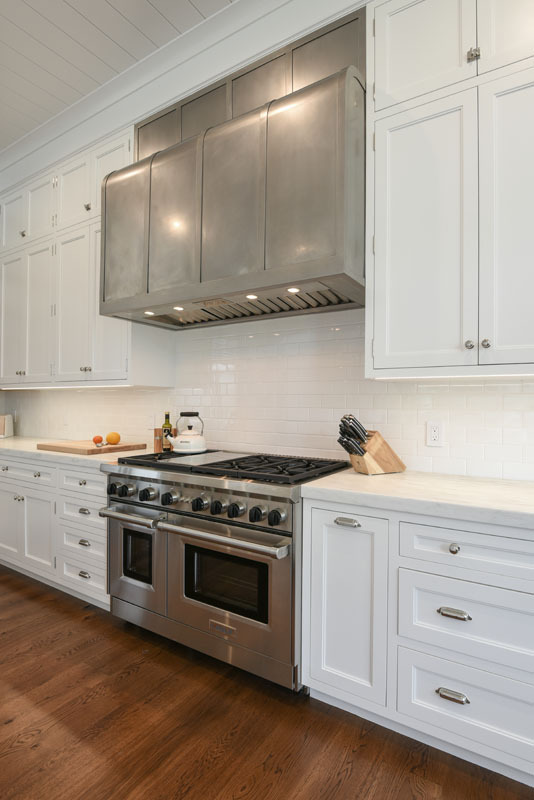 The stainless steel Sub-Zero appliances, powder-coated brushed range hood and metallic-accented Ralph Lauren light fixtures are counterbalanced with feminine wicker bar stools. The kitchen is both beautiful and practical, featuring two sinks, two dishwashers, and two trash compactors to ease the stress of entertaining. The functionalist approach of the kitchen is likewise represented by the breakfast nook and coffee bar that features a television and espresso maker. The large french doors allow a flood of natural light to accentuate the floating white shelves and solid walnut dining table. Beautiful morning light enters in as if to highlight some of the features of this Junior Master Bath: custom Hampton Design cabinetry with backdropped shiplapped walls, 12" x 24" Dolomite marble floors and Dolomite marble countertops, 2" x 4" carrara subway tile and waterworks fixtures. Bold and beautiful with expansive views of West Pond, one of the most unique overall design features is the centered carpet inlay with gray marble tile surrounded by 12" x 24" Glassos tile. Hampton Design then decided to mirror the dimensions of the carpet inlay in the entire shower area. The masterfully crafted tub is from Waterworks, along with the bathroom fixtures. 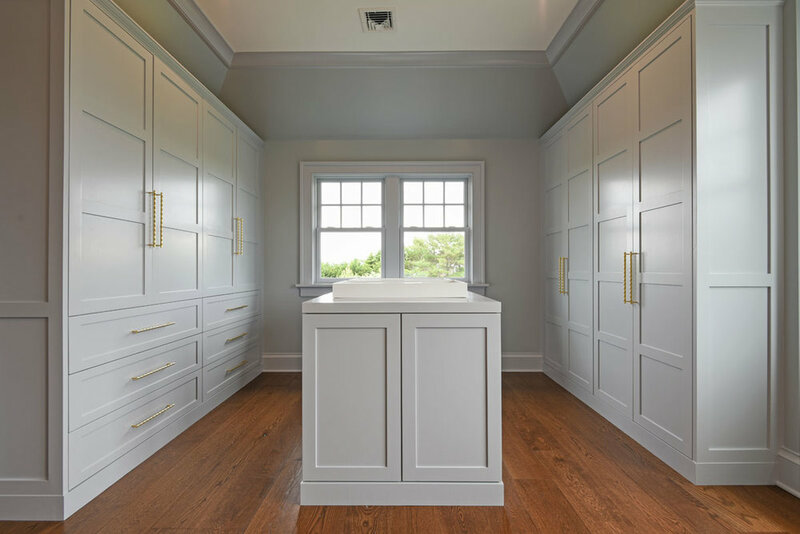 Hampton Design custom-made all of the cabinetry.